This wedding had a lovebird theme, and it suited this adorable couple to a tee! They held it at the historic Crabtree's Kittle House in Chappaqua, NY. This image is so compelling for several reasons. The first thing I notice is the wonderful framing. The tilt here is purposeful and really adds to the image. So often I see camera tilt just for the sake of. Here is gives a dynamic feel to the frame. I'm also drawn to the interesting doors of the Kittle House entrance. They give a wonderful classic feel. I am always looking for interesting architecture and woodwork. Even the old-fashioned door handle adds to the ambiance. Another ingredient in every great photo is, of course, lighting. We love to use rim lighting, and this is a notable example. The eye is also drawn to color, and the green trees behind them provide a pop of that. The dark background also serves to make the couple stand out. I also love the peek of her floral bouquet that you can see through the glass of the door. The loose, breezy bridal bouquet by Forever in Bloom is just divine. Of course, none of this would matter without the gorgeous couple. They look elegant and sophisticated. The bride has just a touch of mischief on her face as she glances over. 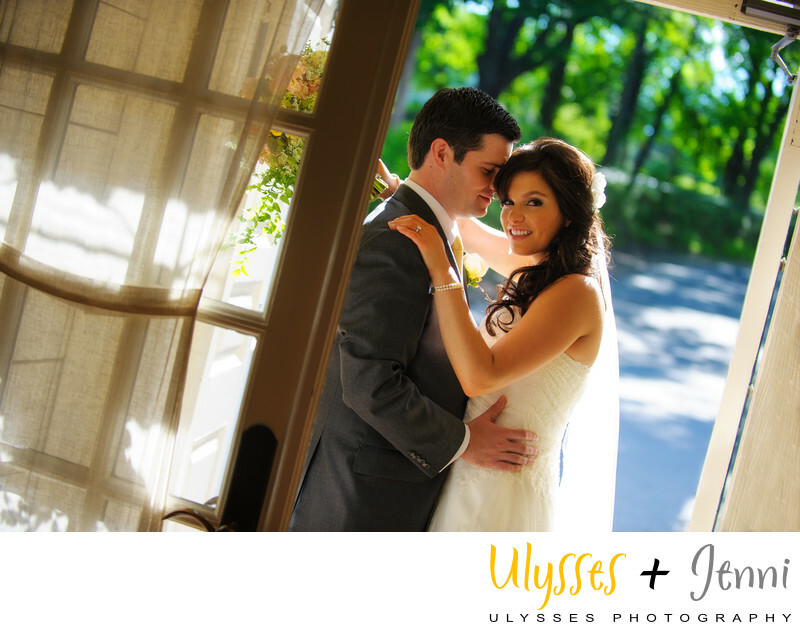 All of these elements melded together into a photo that this couple will never tire of looking at.